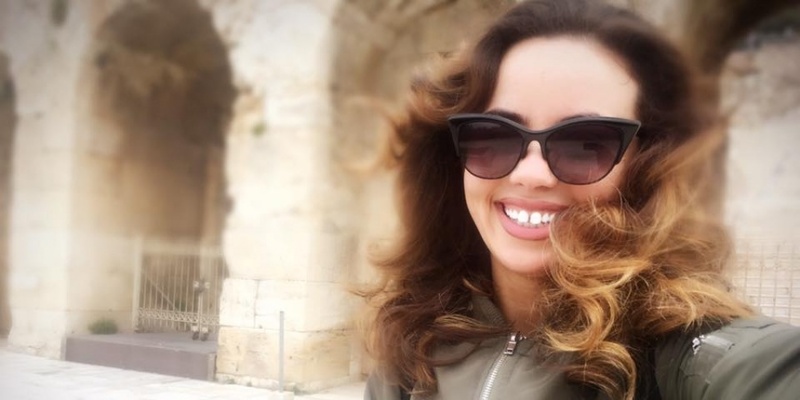 – We're humans above all, so we should just love and accept each other for who we are, says Lindita Halimi, this year's entry from Albania. – I'm emotionally preparing myself. I feel like I'm ready because I love the song and I can't wait to perform it to all my Eurofans and everybody else who's going to watch it, I'm just waiting to enjoy. – I'm trying not to worry, and not to be stressed about it. I am actually trying to fake it a bit, as something that's gonna be fun for me, and not to think that it is a competition. It's an experience. It's always been a dream for me, so I always wanted to make sure that I'm gonna be on that stage someday, so it's finally happening, so.. I'm still enjoying the moment! Eurovision has always been a dream for Lindita. Her first participation in the Albanian selection "Festivali i Këngës" was in 2010, and again in 2014, where she finished 3rd. – When I first saw the Albanian entry, Anjeza Shahini, in 2004, that's when I fell in love with Eurovision. I said: One day, I'm gonna be there. – My nationality is Albanian from Kosovo, It's really the same people, just different dialects. Well, now I live in the United States. I came to Albania for the festival, when the producer (of the song) invited me to be a part of the festival. He said: If you don't come, we're not participating in the festival. So you gotta come, otherwise… It's an honor. I'm doing it! Do you have a favorite Eurovision song of all times? – Yes, I love Ukraine's entry from last year, Jamala's "1944" (singing some of the song). She just killed it, she's so funky, I love her. I can't wait to meet her in Ukraine. I'm a fan. Isn't she amazing? People are telling me, she is really amazing as a person, so I can't wait to meet her. What about your stage performance in Kyiv. Can you reveal some of it? – I can reveal that I'm gonna be wearing white, and maybe that's why I'm wearing white tonight, it's a hint, you know, ha ha. There will be 4 backing singers. They're not gonna be on the stage, so i'm gonna be alone on stage, but ahh... That's all I can really tell you now. The stage performance wont differ much from your performance in Festivali i Këngës? – My song doesn't really have room to have big choreography and stuff like that. It's just about spreading the message, so I wish we could have more than five people, but you know how the rules are, you cannot really have a lot of people on stage. My dream... my wish, was that on stage when I perform I would have kids from all races, you know, holding the globe in their hands, that was just something that I had as an idea, but, of course it's impossible to make that happen because of the rules. What's this fight all for? What's the cost of life in this world? Is to let the love unite us all From the lyrics of "World"
– I co-wrote the Albanian lyrics, but I wrote the English lyrics myself. Everything. It's like the message stays there, it was just like, fitted to English, so.... So the message is the same. – I have heard a lot of great songs. I love the Balkan countries, like Slavko from Montenegro, Tijana from Serbia, Nathan Trent from Austria. I also love the Greek entry from Demy, I haven't met Demy, but I've met everybody else. I also like Sweden, who else do I like? OMG I have so many favorites. I don't know what to choose. – My favorite... hmm... I would say Slavko from Montenegro, and Austria'a Nathan Trent. Those are my two favorites. How do you see the competition this year? – Well, of course the rules says it's a competition, but for me, it it's more an experience. I'm not really competing with anybody, because I feel like everybody who's up there deserves to be there. I just wanna be there, and watch them perform, and just enjoy the show, like a fan too (laughing). I'm just trying to go and enjoy the experience. I'm trying not to think of it as a competition, because it will maybe pressure me emotionally. I'm just trying to tell myself that this is fun. It's not gonna be a big competition, it's gonna be fun, your're making friends with everybody, so there's no need to compete, because competing just sound evil when you think about it. I wish everybody could win. What is your goal in Eurovision? – Of course the goal is to do a great performance, and then, if I make it to the final, which is a great goal for me, of course I wish that I will have good results. And I'm just hoping and praying that god gives me the voice that night, and I don't loose it in the rehearsals. – Let the love unite us all. Human equality. It's not to look at the gender, race or religion. Because none of that matters. We're humans above all, so we should just love and accept each other for who we are. – Just love one another. Do not be judgmental, do not discriminate, this is really the message: Love unite us all.